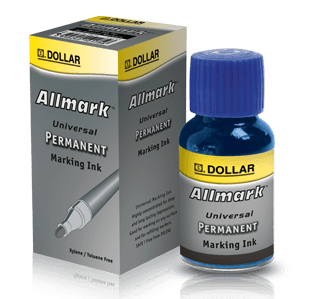 Allmark Universal Permanent Marking Ink. Color Black, Blue, Red, Green. Highly concentrated permanent marking ink for deep and long lasting impressions. Good for marking on almost all surfaces including plastic, paper, cloth, wood, metal etc., as well as for refilling permanent markers. Allmark Universal Permanent Marking Ink. Color Black, Blue, Red, Green. Size : 15 ml. Single Bottle Price Xylene/ Toluene Free. Highly concentrated permanent marking ink for deep and long lasting impressions. Good for marking on almost all surfaces including plastic, paper, cloth, wood, metal etc., as well as for refilling permanent markers.